Any man who wet shaves knows that using a high quality shaving brush can make a huge difference as to how enjoyable that morning or evening shave may be. Shaving facial hair would often leave you with a stunning and attractive look. However, shaving could be a very ugly experience when you do not use the right kind of shaving brush. Irritations, pore infections and bruises are some of the challenges associated with using the wrong shaving brush. A good shaving brush can result in covering your face with a thicker lather, and have an overall more relaxing shaving experience. So, here is a look at 9 of the best shaving brushes we have selected for you. This Parker Safety Razor Long Loft Badger Brush is an attractive looking handmade 4” tall brush with a black handle and a chrome base. 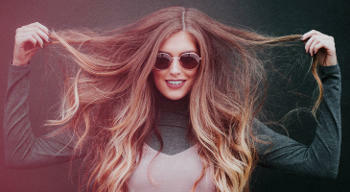 According to the company, its oversized knot and long loft soft and dense bristles help you to make a luxurious lather. This original Parker Safety Razor product comes with a useful free Lucite brush stand which looks nice displayed in your bathroom and is perfect for proper drying and care. Users seem to love this luxurious brush for various reasons. It is solidly built, durable, holds moisture satisfactorily and creates a great quick lather, making your shaving cream last long. The handle is of a good quality and helps you have a good grip of the brush. Its light weight also provides for a comfortable shave. People say that it does not lose bristles and once you break the brush in, the bristles become very soft. The only disadvantage that some users noticed, though, was a light bad odor when coming out of the box, but this is the case with all natural shaving brushes which need a few washes in the beginning till they smell clean. Overall, users are thrilled with this brush and think that it is a worthwhile investment that has helped their shaving experience improve and become more pleasurable. 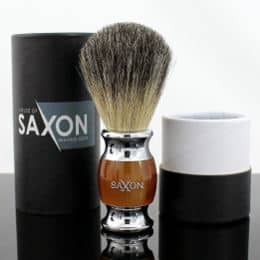 The House of Saxon Real Badger Shaving Brush is made of authentic badger hair and there are no synthetic or nylon bristles used in it since every bristle is badger hair. This shaving product comes in a velvet pouch and with a 100% guarantee. Reviews for this item are very good. 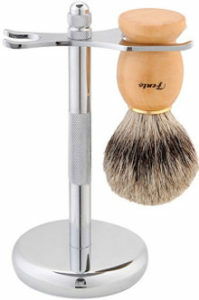 Users think this is a classy looking quality shaving brush with a beautifully designed handle and nice chrome accents. It has a nice weight, lathers well and distributes shaving cream easily across the face. It holds a lot of water and feels smooth on the skin. 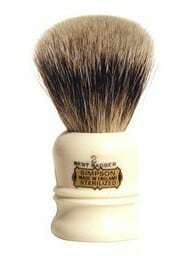 It is durable, keeps its shape well and for a badger shaving brush it is not crazy expensive at all. The company claims that it has a slight scent and while some users don´t even notice it, few others do so. Although it is normal for a badger brush to have some kind of smell, people that notice the odor say that it dissipates after a couple of weeks. 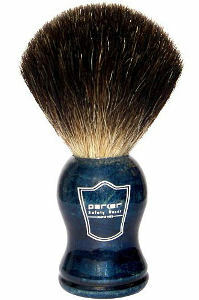 Users also report that the brush does not shed while a few others mention that it sheds but this is normal for a natural shaving brush. The Perfecto Badger Shaving brush measures 4” X 6.5” X 4” with a 2” base and a nicely balanced wooden handle with a shiny finish. There is a metal ring that keeps the knotted bristles firmly embedded in the handle of the brush. This brush gets extremely good reviews. Users say that it creates a nice thick lather and holds it well. Also, the lather cleans out of this badger brush easily. Its hair bristles feel soft but they are stiff enough to make the hairs of your face stand up a little more and provide you with a good coverage. It holds its shape much better than synthetic brushes and glides across the skin nicely. Its handle is very easy to hold even when you have wet hands. While most people say that it sheds like a normal badger hair brush, few others mention that it sheds more than what they would prefer. Overall, users state that this shave brush works very well and can be purchased for a reasonable price. 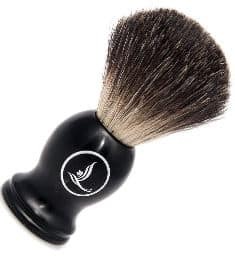 This Perfecto Badger Shaving Brush is about 4” tall and comes with an attractive black handle. The bristles are soft enough to create and hold a comfortable lather on the face, but stiff enough to exfoliate those dead skin cells and prepare your skin for a close and comfortable shave. Reviews are very positive. People feel that this is a high quality brush that holds lots of lather and is easy to hold. It spreads lather evenly and makes shaving more enjoyable and relaxing. 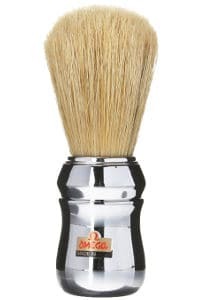 This Omega boar bristle brush also known as the PRO 48 boar bristle brush is made in Italy and features high quality boar bristles and a chrome colored ABS handle. A quick look at this brush might give you the impression of a cheaply made shave brush, but first impressions like these would be wrong. This is a big brush which like any boar brush needs some time to break in. It lathers quickly, holds a lot of lather and softens well. Users state that it has firm bristles that can be more suitable for thick or coarse beards and they believe that the brush works better with time. Like most boar brushes, it has an animal odor that some people complain about but they still say that after a couple of weeks the smell disappears. 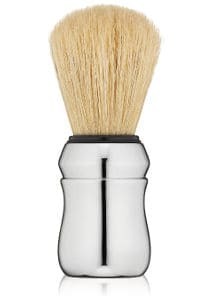 In addition, this boar shave brush dries up quickly enough and loses only few bristles. Overall, it is a reasonably priced shaving brush which users say that the longer you use, the better it feels on the skin. You just need to keep in mind to dry it completely between uses. 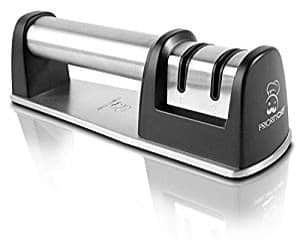 This Proraso Boar brush is made in Italy and features a chrome looking plastic handle and long boar bristles. This is a big brush that is reasonably priced and holds its bristles very well. People say that it is durable and dense, holds a lot of water and makes a good lather. While some users say that the bristles feel stiff in case you have a sensitive skin, others think they are soft, so it can be concluded that various users get a different experience according to their skin´s sensitivity. They also think that it is easy to break in, lasts a long time and dries well. For a natural shaving brush, it has an animal smell that remains for a few weeks. 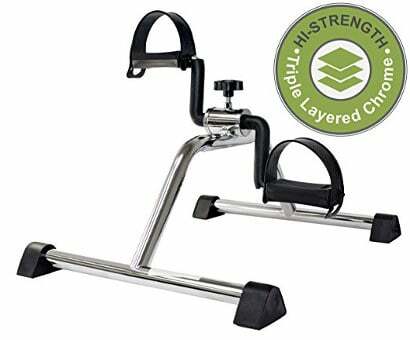 While there was one reviewer that found it kind of bulky and not so comfortable to use, another one noted that the handle has a nice shape which gives a great feel and makes it easy to hold. 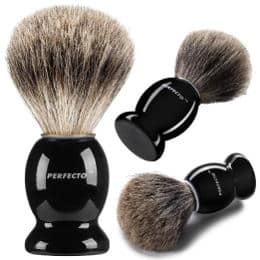 The Latherwhip Badger Hair Professional shaving brush is a well made brush that features a 22mm tight knot, and comes with a 60 day 100% money back guarantee and an elegant looking gift box. The brush is handmade and its resin handle gives a good balance to it. According to the company, it whips up a great lather, retains water and heat, rinses and dries well. Its tight knot, strong bond and handle ensure minimum bristle loss while its soft as well as firm enough bristles work fine on the skin, providing it with exfoliating benefits. Reviews for this brush are very good with most users saying that it holds and distributes lather well and that its bristles are thick and soft. There is some initial shedding, but it is extremely minimal. The animal smell vanishes after some uses. Users also find it extremely attractive. This is a handsome looking Parker Safety razor brush featuring black boar bristles and a beautiful blue wood handle. The bristles are genuine black badger bristles which are very dense to create the perfect lather and offer exfoliating benefits. A free stand is provided to you when you buy the brush. People say that this is a great value shaving brush for the price. Its bristles are of good quality, soft up to a point and hold lather extremely well. 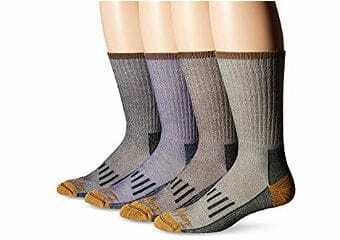 They are also fastened well to the handle and a minimum shedding is noticed. Users say that it feels good in the hand and on the face and love its blue wood handle. Overall, they think that the brush also makes a nice gift. 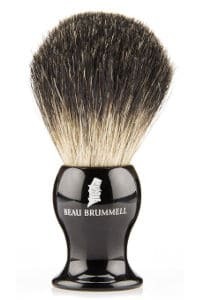 The Beau Brummell Shaving Brush with 100% pure black badger hair features a black faux horn resin as well as 100% hand picked and hand sheared pure black badger hair bristles. Reviews for this brush are very positive with users stating that this is a good quality product with nice soft bristles and a large comfortable handle. The brush lathers well with a shaving cream and distributes it to the face evenly. The light badger hair smell dissipates after some uses. 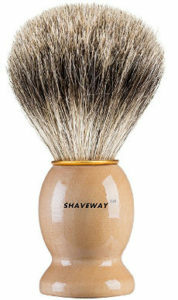 This Shaveway pure badger shaving brush promises users the best shave of their lives and it is suitable for a variety of shaving methods. It mildly exfoliates the skin while supporting a rich lather that is required for a great shave. It is also used to sprinkle the required amount of wetness on the face which is great for a wet shave. Finally, it may shed a little after being used for a while but this is expected with every original badger product. This Fento badger hair shaving brush comes with a wooden handle and delivers rich lather for a great shave. It also features a stand that encourages safe brush drying for durability and impressive hygiene and has a rust proof and rubber handle for great convenience. Overall, this classic product gives a very thorough cleaning and it adds beauty to your bathroom appearance. 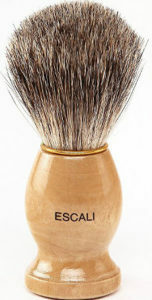 This Escali badger brush is made from genuine badger hair and delivers a soft and luxurious feel anytime you use it. It produces full lather during use and this happens effortlessly to prepare your face for a great shave. This product is designed to retain a significant amount of water which allows for the best wet shave and makes rinsing the face very convenient after shave. It is also designed for resilience and is carved out of very durable wood to deliver a long time of service to customers. Finally, it feels very comfortable on the face and mildly exfoliates dead skin cells as well. 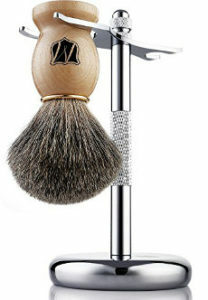 This hand crafted shaving brush is designed with some of the finest materials to give the highest quality to customers. It features a solid wooden handle and exfoliates the skin, leaving your face feeling very refreshed after shave. It produces a great lather which is quite easy to wash off. In addition, it is very convenient to utilize. 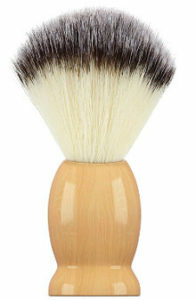 This Miusco shaving brush is made purely from badger hair and produces lofty lather for an enjoyable shaving experience. It exfoliates the skin and reduces skin irritation after shave while obviating the chances of a pore infection. Besides, it comes with an impressive shaving stand that provides both aesthetic value to your bathroom and reduces the chance of your shaving brush picking up bacteria. It also keeps your shaving brush dry in preparation for a new shaving session. This Semogue shaving brush is top of the line as a premium ninety percent boar brush. It features an Acrylic handle material that is very comfortable and allows for an enjoyable shaving operation. 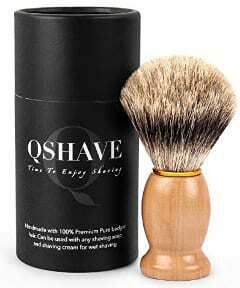 This Qshave badger hair shaving brush is a good looking product and comes with 100% badger hair. It is handmade and creates rich lather very fast. The bristles allows for this brush to hold significant amounts of water for a very convenient shaving experience while the handle is made from genuine wood and is designed for a very firm grip. This product can be used with whatever shaving substance you desire to use. It is expected that a slight shedding may happen as this is revealing of genuine badger hair. 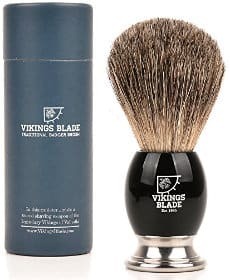 Vikings Blade is undoubtedly a luxurious badger brush that delivers the finest shaving experience to users. 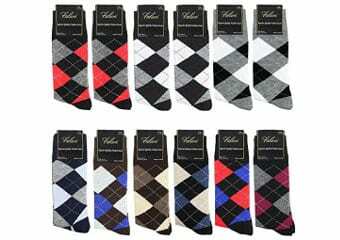 It is made from great quality material and features 100% badger hair. It is free from any form of entanglement and has a reputation for maximum fluid retention which is required for an enjoyable wet shave session. It comes with a heavy Swedish alloy base and an obsidian acrylic handle that delivers durability and a fantastic grip. You may also find that the brush releases a mild smell of badger which is one of Vikings trademarks. 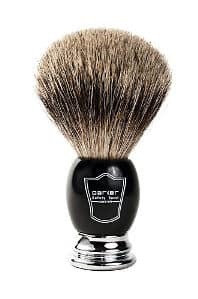 This Simpson Duke is a very impressive badger shaving hair brush and comes with standard features and functionalities for a great shaving session. 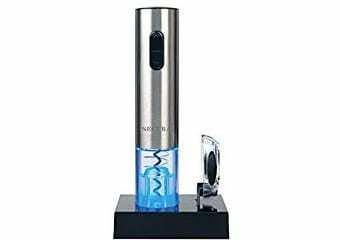 It is suitable for wet shave and has a great handle for effective shaving operations. This Semogue shaving brush features boar bristles that hold water impressively for a smooth wet shaving experience. It creates lather very fast and makes it easy to wash off after shaving is done. 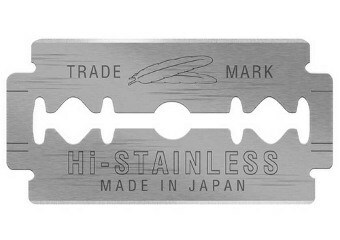 This is a proudly European product and delivers a traditional shaving experience to users. 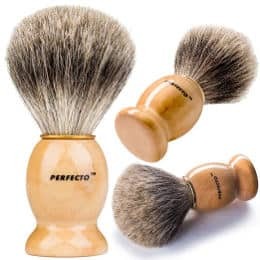 So, if you are looking for that best shaving brush that is reasonably priced and will enhance your wet shaving experience, why not begin your search with these popular and highly rated brushes of our review?